In the videos below we were comparing two Mark Knopfler Signature Strats to a 1964 Fender Stratocaster, also in red (fiesta). Talking about red, note that one of the signature Strats is in the ‘wrong’ colour the very first ones came with, while the other one is the normal hot rod red. It is always interesting to hear how different three Strats will sound, even Strats of exactly the same model with the same specs. We feel the hot rod red Strat sounds warmer and fatter while the darker one has a nice transparent sound, a bit crisper but also warm. 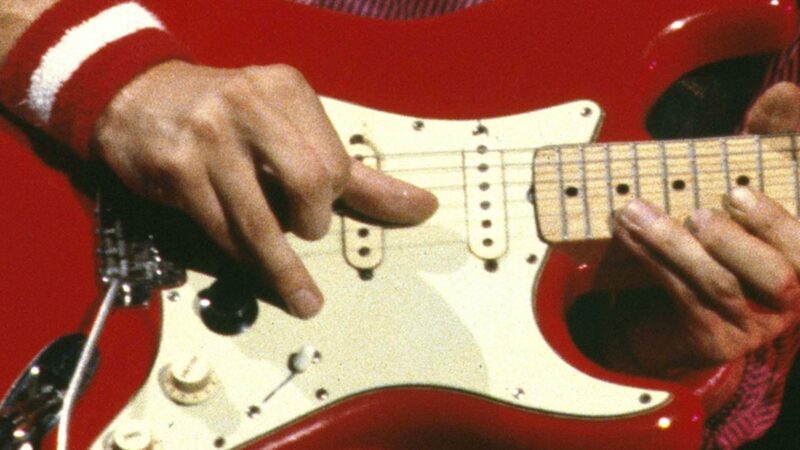 The ’64 Strat does not have an ash body like the signatures, but one of alder (like Mark Knopfler’s 1961 Strat), and the fingerboard is not the slab board (that was produced between 1959 and 1962) but the thinner veneer board. This particular guitar has a bell-like transparent sound with a typical slygthly nasal midrange. All in all, three great guitars which all sound different but all great. All guitars had 10er strings and were played over a Music Man amp, no effects. Here is a poll in which you can let others know which one you personally like best. Which one of the three Strats sounds best to you? Nice demo as always. I really like the vintage strat because i think it has more character to it. Nice work on the vfs-1 pickup, I might get a pickguard for in my strat. Also a question…. I saw Mark in Ahoy this year with Bob Dylan. It seems like he has a new les paul (blue), do you have any idea what kind ? The blue Les Pauls is a R9 reissue by Gibson. I’ve bought a 1964 strat very cheap most people think its a fake”?